Official attention will make or break bitcoin. Scrutiny from tax authorities like the U.S. Internal Revenue Service and financial regulators around the world may deter off-the-grid types from using the digital money. Yet interest from investors and even creators of derivatives could start drawing bitcoin into the mainstream. An easy, relatively anonymous way to store value and make online and cross-border transfers has appeal both for those who don’t trust governments and those whose nefarious activities require them to avoid oversight. The bitcoin world for now remains volatile, opaque, and – as the disappearance of a big stack of them from Tokyo-based exchange Mt. Gox demonstrated – not fully secure. Even so, serious investors are becoming converts. Netscape co-founder Marc Andreessen took on bitcoin-skeptic Warren Buffett on Twitter last week. Andreessen sees in bitcoin a smart application of technology that allows transfers over the internet in a way that leaves both sender and recipient confident there’s little scope for fraud and avoids the cost of paying a middleman like a credit card issuer. That could be very valuable. Andreessen’s venture capital firm has invested about $50 million in related companies, like Coinbase. Even the volatility of bitcoin – the value of each unit has gone from over $700 to peak near $1,000 only to dip to about $500 over the past three months – may be amenable to smoothing. Tera Group on March 24 announced what it claimed was the first standardized bitcoin swap. Moreover, the controversy surrounding bitcoin is forcing mainstream government entities to take note. Last week, the IRS determined that bitcoin holdings would be treated as property, not currency, for tax purposes. That means that intangible moolah is now concrete enough to blip across the tax radar. It’s also under discussion at the Commodity Futures Trading Commission and other U.S. regulators, while EU financial watchdogs have warned users about the risks of bitcoin and China’s authorities are clamping down. If all the interest doesn’t kill off bitcoin, it will gradually legitimize it. Then the digital dough could become as commonplace as PayPal or even a credit card swipe. Despite the enthusiasm of Andreessen and others, the jury is still out. But one thing is clear: whichever way it goes, bitcoin’s days in the shadows are surely over. 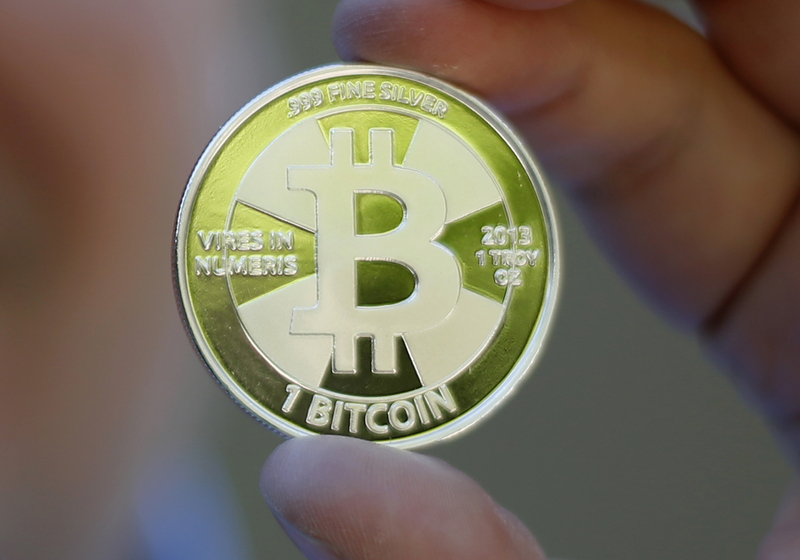 Some of Bitcoin enthusiast Mike Caldwell's coins in this photo illustration at his office in Sandy, Utah, September 17, 2013. The U.S. Internal Revenue Service said on March 25 that it would consider bitcoin holdings and other virtual money as property rather than currency for tax purposes. If held as capital, like other investments, a taxpayer’s gains or losses would be treated as capital gains or losses. Tera Group said on March 24 that it had created the first standardized bitcoin swap agreement. Although the Commodity Futures Trading Commission does not yet regulate the virtual currency, Acting Chair Mark Wetjen said on March 11 that the watchdog is discussing internally how to do so. Circle Internet Financial, a digital currency company, disclosed on March 26 that it has acquired $17 million in financing, bringing its total to $26 million. The same day, the company also announced a limited release of its secure, simplified online tools for consumers to do transactions using bitcoins.